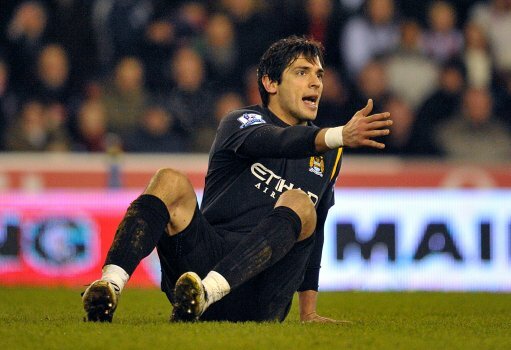 To nab a quick quote from today’s Guardian, Roque Santa Cruz‘s ‘periphal existence at Manchester City’ looks set to continue (until about January time, I’d wager) after the club announced this morning that the injury-ravaged striker has not been included in their 25-man squad for the first group stage of the Europa League. Santa Cruz also failed to make the cut for City’s qualifying ties with Timisoara last month, and his prospects at Eastlands now look dimmer than ever – although he has been included in the Roberto Mancini‘s Premier League squad. Since joining City from Blackburn 15 months ago, for the heavily inflated sum of £18 million, Santa Cruz has managed to notch just four goals in competitive matches. GK: Shay Given, Stuart Taylor, Joe Hart. DF: Micah Richards, Wayne Bridge, Vincent Kompany, Pablo Zabaleta, Aleksandar Kolarov, Jerome Boateng, Joleon Lescott, Kolo Toure, Shaleum Logan. MF: Michael Johnson, James Milner, Shaun Wright-Phillips, Adam Johnson, Gareth Barry, Patrick Vieira, Nigel De Jong, Yaya Toure. FW: Emmanuel Adebayor, David Silva, Jo, Carlos Tévez, Mario Balotelli. This makes total sense given his injury record. He is included in the 25-man premier league squad so he is clearly valued. Putting him out twice a week would heighten the chances of injury, so there is little point risking him in the Europa League squad. Too bad for Santa Cruz that the transfer window has closed!!! I was wishing he would go to Lazio, I guess he could have better chances of being appreciated there!! !